I was reluctant to write this post because it means that the Roskilde Festival and this incredible academic, musical, and cultural experience is over. Over these last three weeks we explored social theories, organizational structures, and Danish volunteerism centered on the Roskilde Festival – a unique, huge nonprofit music festival in Roskilde, Denmark that began in 1971 and utilizes 34,000 volunteers to put on an incredible 8-day musical and cultural experience for the 80,000 guests. Camping and volunteering at the festival served as my class’s study tour and was arguably one of the most fun, adventurous experiences of my lifetime, redefining the meaning of experiential learning and immersion into Danish culture. Although the festival has international guests, it is mostly Danes and the course was an incredible insight into Danish volunteerism, education, and the “Orange Feeling” – Roskilde’s mysterious synergy among the attendees that creates an atmosphere of friendship, happiness, and openness. This attitude immediately welcomed my classmates and I who volunteered in the Art Zone, an interactive area at the festival in which participants could relax, view creative light installations and performances, and walk around the structures designed by urban artist Maser. We performed a variety of tasks to assist with the construction – painting, cutting fabric, securing walls… I enjoyed working with my hands and talking with the other Art Zone volunteers. Several were architecture students working to complete light installation or gaming projects, using their holiday for long hours of unpaid physical labor for an installation that would last only four days. Can you imagine students in the US doing such a thing with their holiday? It was an incredible insight into the stark differences between the education systems in Denmark and the U.S. Here, volunteerism and work that promotes learning is encouraged and, even though it was temporary, effort and enthusiasm were high. A special part of Roskilde Festival for many of the guests is camping with friends, often with the same group each year, and the huge camping areas are filled with tents, speakers, and people having a good time. We camped in an area for volunteers only (so a bit more quiet, ha!) and had so much fun hanging out at our camp or walking through the main camping areas, joining a dance party or conversation as we walked along. The 4th when we joined forces with “Camp International” and hosted a ‘smores roasting event. Many Danes haven’t heard of our favorite summer treat so it was fun aspect of America to share. Some Roskilde guests so love the camping and being with friends that the music isn’t even a priority, something different than American festivals but perhaps a commentary on the culture – it’s about being together and making friendships. If you see a concert, cool, but it isn’t the most important part. It is difficult for me to encapsulate the Roskilde experience because it was overwhelming and wonderful in so many ways. In the realm of music The Rolling Stones, Stevie Wonder, and Jack White moved me, but the festival and my experience of the Orange Feeling was more than music. It was being with such a huge amount of people, bonding with my classmates and talking with people about their Roskilde experiences. 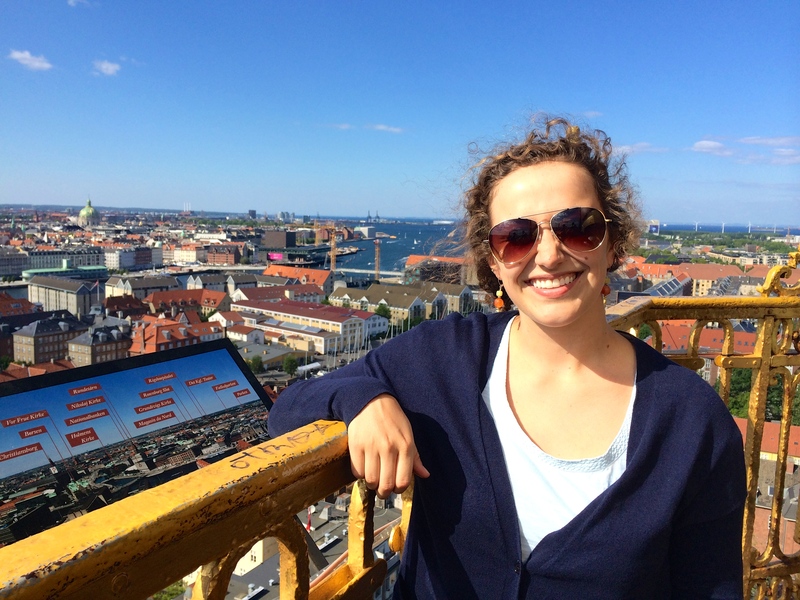 This nontraditional environment gave me insight into Danish cross-generational values of volunteerism, exploratory learning, and Roskilde Festival – a special place to celebrate, listen, explore, and slow down to enjoy people, music, and life. During our wrap-up session, a classmate of mine said that the festival reminded her of the quote, “Life begins outside your comfort zone.” I’m so grateful that DIS and Roskilde gave me exactly that and I know it will stay with me forever as not only a memory but a philosophy. Feel the Orange! You offer your reader such vivid descriptions of the multidimensional experiences you have had through DIS. Your education there is provided in classes with progressive teachers and styles of learning and fascinating subjects but your EDUCATION is absorbed throughout your participation and openness in all that you discover: friendship, collaboration, adaptation, and fun. Orange is the new attitude for life. 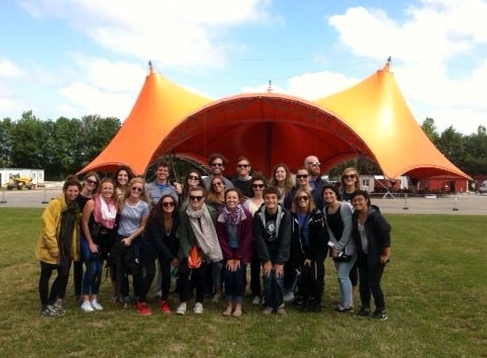 It comes as no surprise that an event such as Roskilde would be the sense and sensibility peak of your study abroad. So far!